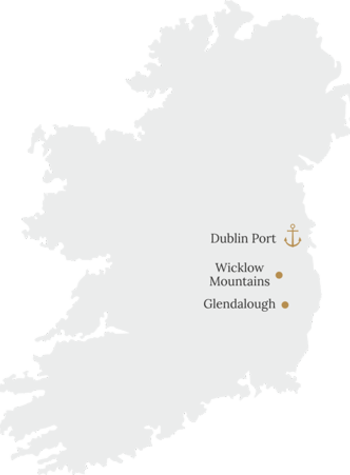 Join this semi-private small group shore excursion from Dublin Port (or Dún Laoghaire). Visit beautiful Wicklow Mountains & Glendalough ruins before Dublin city sightseeing. Your vehicle seats no more than 25 passengers allowing for maximum comfort and interaction with the guide. Your day will begin in style as we collect you from the dockside. Cruise ships arrive at various times and your tour will begin as soon as disembarkation is instructed by the captain. Please disembark immediately so that we can get ahead of the lines and make the most of your day on shore. The day begins with a picturesque drive through the Wicklow Mountains. Fans of P.S. I Love You and Braveheart may feel a sense of deja- vu as the rolling countryside provides the backdrop for both Hollywood blockbusters. Enjoy a stop at Glendalough, the Valley of Two Lakes where you can explore the 6 th century monastery of St. Kevin. Medieval stone towers, houses and Celtic crosses await. The return journey takes you through some of the finest landscapes of Co. Wicklow. Picture postcard lakes, turf- bogs, streams and hills help to give this area it's nickname: The Garden of Ireland. Following lunch (or a refreshment stop for boats arriving late-morning) we will show you the best of Dublin city. Look forward to highlights such as Trinity College, St. Patrick's Cathedral, Temple Bar, O'Connell Street, Halfpenny Bridge, Molly Malone Statue and Christchurch Cathedral. Before returning to the boat enjoy some retail therapy on Grafton Street - Dublin's premier shopping destination. If your ship departs late- evening we'll drop you dockside 1.5 hours prior to departure. Even if your boat is leaving earlier we'll make the necessary adjustments to the tour and have you back in ample time.